My favorite liquor by far has to be Gin. There can be no greater expression of gin’s history and utility than the simple gin and tonic. To that end I am always on the hunt for the next great tonic water. Tonic water itself has a long history and it all starts with the main ingredient Quinine. Quinine is used for two major purposes, the first is flavoring tonic water and the second is fighting malaria. The entire reason to make tonic water in the first place was to serve it to people worked in malaria ridden portions of the world. Quinine was originally derived from the bark of a south american tree called the Cinchona. A hardy little tree that grows at very high altitudes in the Andes mountains. The Cinchona contains several alkaloid chemicals and was shown to the Spanish by South American natives sometime between 1560 and 1782. Because the chemical was so effective a treatment and malaria so common in parts of the world being actively explored at the time, use of the bark as a medicine became common among sailors in the Spanish and English navies. When combined with the sailor’s ration of lime juice to ward off scurvy and their gin ration you have the beginnings of the gin and tonic as it spread across the British empire. Modern tonic water bears very little resemblance to that originally crafted in its heyday. The difference between a recreational use and a medical use is significant. The US FDA limits tonic water to no more than 83mg per liter while a therapeutic dose is closer to 500-1000 mgs. As a result modern tonics are less bitter and often sweetened resulting in problems for those seeking to create classic cocktails from older bar guides. Schweppes: Dating back to the 1780s Schweppes claims the title of oldest soft drink in the world. The company has undergone some changes over the years as it has been bought and sold. Schweppes brand is currently owned by the Dr Pepper Snapple Group based in Plano, Tx. They also produce Canada Dry so I saw no reason to include that brand here as they are functionally pretty similar. Fentimens: Using a recipe that dates back to 1905 the current Fentimens company was relaunched by the Great Grandson of the founder in 1988. They claim to ferment and brew their sodas for 7 days. Fever Tree: Based in London, UK their first product released 2005 was their premium Indian Tonic water. They have since followed up with a number of variants including a naturally light, elder flower and Mediterranean variety. Q Tonic: Founded in 2004 and based in New York. Q drinks strives to make a high quality tonic water. They have also released a number of other lines including ginger beer, grapefruit and lemon. Bradley’s Kina Tonic: Based in Seattle, WA and created in June of 2013 Bradley’s was the result of successful kickstarter campaign. At present the Kina Tonic is the only product they have. Unlike the others Bradley’s is a syrup which requires the addition of carbonated water. To make for a fair comparison we need to get each of these into an equal solution. With one syrup on the bill that means figuring out a fair dilution. Bradley’s website calls for 0.75 oz of syrup to 3 oz club soda. So as a baseline we should use 3.75 oz of each product in out setup. I don’t want to extend much above 5 oz total but a 1.5 oz shot of gin should be sufficient to make things work. London Dry is the traditional element to use in this case and so I’m going to try two gins, Bombay Sapphire and Tanqueray. Both should give the more significant juniper flavors that this needs. With five competitors and two gins this is going to be a struggle to complete, but I throw myself on that grenade for you dear reader. In the end I wound up doing this in a couple of batches. I brought the bottles with me and had various people taste them both with and without gin. 5. Schweppes: About what you’d expect, pretty mild. Slightly sweet with low to minimum bitterness. Rated lowest of all of the options. 4. Q Tonic: Lacking the corn syrup of schweppes Q tonic rated slightly higher with all testers. The flavor was cleaner but also significantly more bitter. 3. Fentimens: There is a distinct lemony flavor to this tonic likely from the use of lemon extract or citrus oil in addition to the citric acid. It was the only one of the bottles that disclosed the exact flavoring ingredients so it’s likely that others had similar items just in lower amounts. 2. Fever Tree: A close tie with the Fentimens for favorite bottled the fever tree was by far the smoothest of the five for flavor with gin. 1. Bradley’s: The far out winner for flavor was the bradley’s tonic. I don’t think it was entirely fair as the Bradley’s was built as a flavorful tincture rather than a simple tonic but most people sampled were far more impressed with the flavor of this than any other tonics. It should be said that all of these can be bought over the internet for similar prices as what you’d find in stores. 1. Schweppes – $1.25 for 1L, available pretty much everywhere. The schweppes, Bradley’s and Fever Tree all have screw caps that close well keeping the carbonation in long enough to use up a whole bottle. The Q tonic does come in cans and larger bottles with screw caps but the volume is daunting unless you’re throwing a G&T party. Most of these recommend using the product within three days of opening so gauge your need versus the quantity because it goes flat quickly. Again Bradley’s comes out the clear winner here because it keeps longer in the fridge and can be used in any quantity you want, the need for club soda to mix is a drawback but having a soda stream on hand makes that an easy adjustment. It is sold in fewer places but obviously can be bought less often and stored for longer periods. 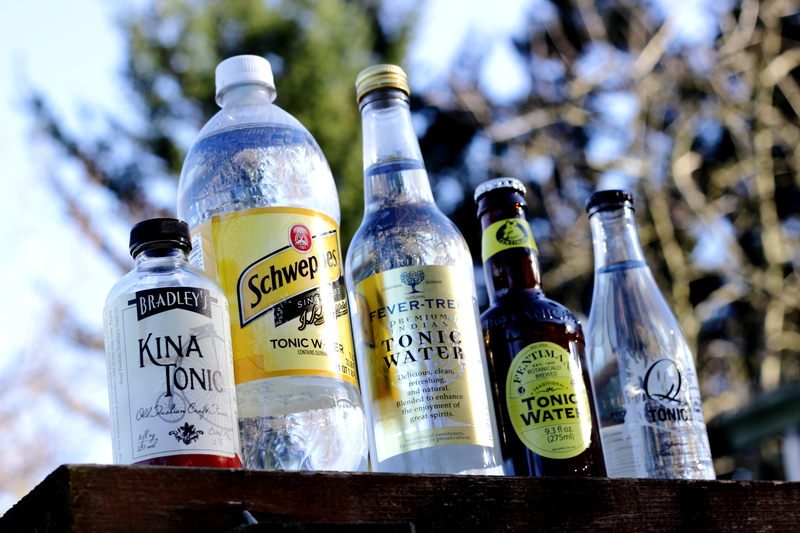 Posted in Feature.Tagged bradley's, comparison, feature, fever tree, kina tonic, qtonic, schweppes, Tonic water.